It might sound crazy, but if you lived right at the north pole of the Earth, you would only see one sunrise and one sunset every year. Since the Earth is tilted in space in respect to the sun, between mid-March and mid-September, the northern half of the Earth is tilted more towards the sun. The rest of the year, it is tilted more away from the sun. This means closer you are to the north pole, the longer the sun is up in the sky during the warmer months. If you’re right at the north pole, the sun is up for a full 6 months (followed by 6 months of darkness). Where the sun never sets? But there may be places in the solar system where the sun never sets—like on the moon, for example. This is of special interest to space explorers if they ever want to set up some sort of moon base. If we ever manage to set up a moon base where people could live, many obstacles need to be overcome. Aside from the moon having no breathable air, no liquid water, and no Earth-like magnetosphere to block deadly radiation from the Sun, some of the biggest obstacles are the extreme temperatures and variations of sunlight on the moon. When the sun sets, the temperature dips down to a bone-chilling -240º F (yes, that’s below 0º, over 3 times colder than the south pole in winter on Earth). This period of nighttime also lasts about two weeks. Surviving on the lunar surface will take energy to run all our life support systems. But without the sun for a couple weeks at a time, having enough energy will be a challenge. That’s why scientists are looking for the “peak of eternal light” on the moon. You see, unlike the planet Earth, the moon’s axis isn’t tilted very much. It’s axis runs nearly straight up and down in the solar system. So, let’s say you traveled to the north or south pole of the moon. As the moon spins around on its axis, in theory, there might be a hill or crater edge somewhere where the sun never sets. Like standing in the middle of a merry-go-round, standing on the pole of the moon, you would spin in a tight circle—and the sun would remained very low to the ground, just grazing the horizon, circling around you all the time. Has anyone found a “peak of eternal light” on the moon? There are several mountain peaks and crater rims along the north and south poles of the moon that get sunlight at least 80% of the year—and some a lot more. On the lunar south pole is Shackleton Crater (appropriately named after the famous man who explored Earth’s south pole, Ernest Shackleton). 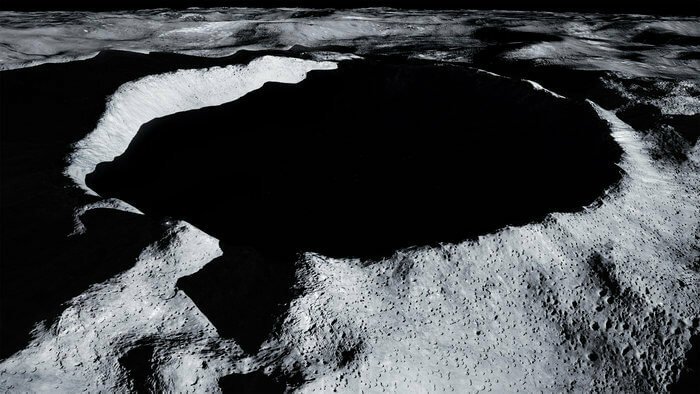 It’s 13 miles in diameter and 2.6 miles deep—and since it is so close to the axis of the moon, the interior of the crater is never tilted towards the sun. It never receives daylight deep inside. But the rim of the crater is so high above the landscape, the sun nearly always shines on parts of it. One study found that along the rim of the crater there are some sites that are illuminated by the sun for 94% of the lunar year. And there are a couple ridges extending from the crater that also receive daylight a combined 94% of the year (since both ridges cast a shadow on each other at different times). A space probe called SMART-1 (created by the European Space Agency) took many images of the moon’s south pole. Using those images, this 3-dimensional model was created to show possible peaks of eternal light. When artist Jorge Mañes Rubio was doing his residency at the European Space Agency, envisioned what a human colony—or what he calls a “moon temple”—might look like at the peak of eternal light.